In Language and Learning in the Digital Age, linguist James Paul Gee and educator Elisabeth Hayes deal with the forces unleashed by today’s digital media, forces that are transforming language and learning for good and ill. They argue that the role of oral language is almost always entirely misunderstood in debates about digital media. Like the earlier inventions of writing and print, digital media actually power up or enhance the powers of oral language. 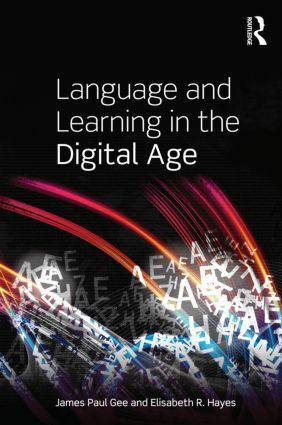 Gee and Hayes deal, as well, with current digital transformations of language and literacy in the context of a growing crisis in traditional schooling in developed countries. With the advent of new forms of digital media, children are increasingly drawn towards video games, social media, and alternative ways of learning. Gee and Hayes explore the way in which these alternative methods of learning can be a force for a paradigm change in schooling. This is an engaging, accessible read both for undergraduate and graduate students and for scholars in language, linguistics, education, media and communication studies. Elizabeth Hayes is Professor of Education at Arizona State University.